And - what's important - you can protect yourself and send/receive highly-encrypted messages. 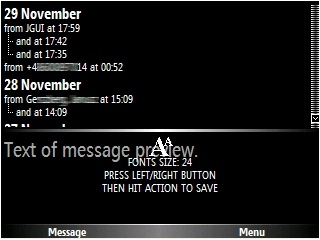 This is a special, the newest version of A.SMS program, designed for black style Windows Mobile phones. 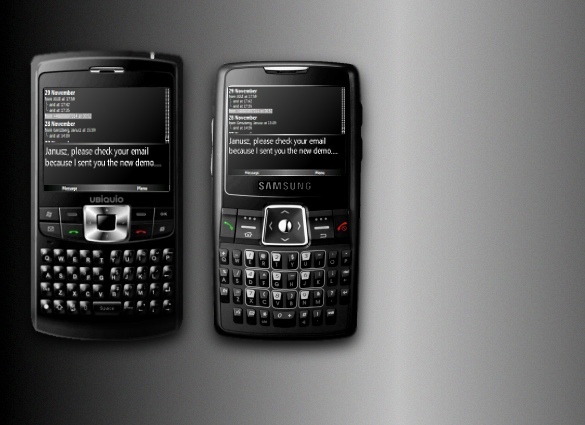 Some know devices (in the end of 2006): Samsung i320, i600, UBiQUO 501, Motorola Q. Although there is no reason, no reason at all, to use it with other Windows Mobile phones, if you like. 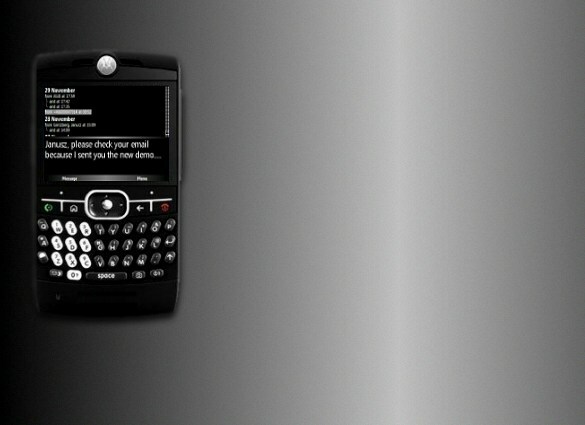 and with Windows Mobile PPC phones with touch screen features, or hardware full keyboard. Recommended screen resolutions 320x240, or 240x320, or 240x240. This version is distributed for personal use. It is only limited, to not use encryption features. 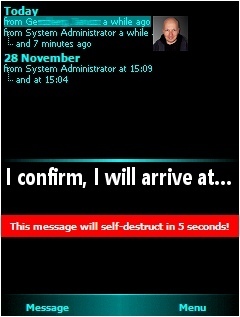 A self-destruct message will delete itself, right after it displays on Recipient's screen. Certainly, only when Recipient uses A.SMS Messaging program too. On special request, you can unlock to the full version. This version uses higher encryption algorithms to protect your messages with personal passwords. Recipient has to use the same password and the same algorithm to read this message. or some third part intercepting persons. Please read below more details. 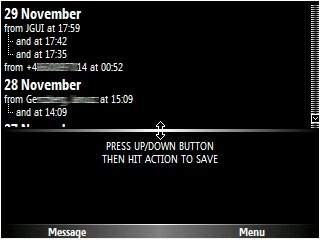 Left menu displays new dialog to compose message. 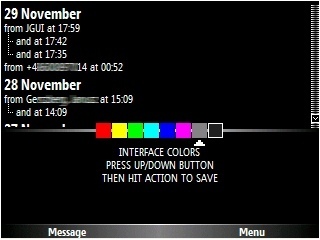 Right menu displays selection of features. You can use one of 7 pre-defined colors, or a whole "black". This same interface in other screen orientations. and preview parts of screen and scrolling. Left menu sends the message away. While you write two or more characters in "Send to:"
Recipient's number, it will display a list of Contacts. This function works different than in the default messaging application. you have next 2 seconds to start selecting some name/number from the list. If you will not do, the list disappears, and you go back to the number. by first name, second name, and initials. Or by mobile, car, and home telephone numbers. the message you read already, will self-delete after around 15 seconds. You can break this action by moving to another message from the list. to the top position - no message is highlighted by gray background). correspond in time of receiving with your selected options, at once. the self-destructed message will delete in the background. can be regulated or restricted in some countries or government rules. Please understand, you answer before the law personally. The author of this program, does not take any part of responsibility. That programs, name and source codes are protected by copyright law and international treaties. Unauthorized reproduction or distribution of that programs, or any portion of it, may result in severe civil and criminal penalties. 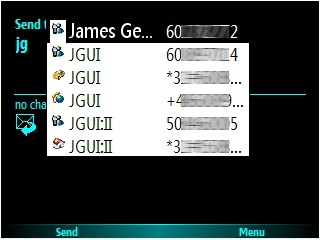 JGUI names, logos, pictures are trademarks or registered marks. Windows Mobile, Windows Smartphone, MS Origami are copyrighted by Microsoft Corp.